Chesterfield quick clip fasteners are durable adhesive base post fasteners which can be attached to folders and charts. The compression bar and extension allow fasteners to securely hold many pages. With our multiple quantities available for ordering, you can be sure you have just as many as you need. Chesterfield quick clip fasteners can be ordered in full sets (including bases, extensions, and compressors) of 100, 500 or 1000 pieces. The components can also be ordered separately in 100, 500 or 1000 piece quantities. Chesterfield poly end tabbed folders are made of rugged .023 gauge polyethylene which are easily cleaned and reusable. The tabs are also scored to make attaching labels easier. For convenience and easy organization, 10 colors are offered. 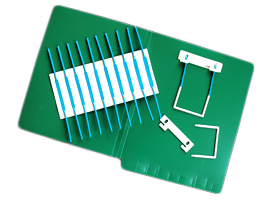 Durable adhesive base post fastener can be attached to folders and charts. Compression bar and extension allow fasteners to hold many pages. Can be ordered in full sets or individual pieces, in quantities of 100, 500 or 1000. Rugged .023 gauge polyethylene folder available in 10 colors. These end tabbed folders are easily cleaned and reusable. Scoring on the tab makes placing labels easier. Files are protected and can be easily seen in rows with color coding.